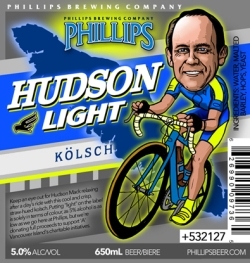 VICTORIA, BC – To help mark the waning days of summer, Phillips Brewing have just released Hudson Light Kölsch, a crisp and refreshing golden beer brewed to 5% abv. The name and label are in honour of Hudson Mack, anchorman on ‘A’ Vancouver Island and a staple of the Victoria news community. Full proceeds from the beer are going towards ‘A’ Vancouver Island’s charitable initiatives, one of which is the Tour de Rock, where Hudson will be proudly cycling Vancouver Island starting on September 19 to help raise money for cancer research. Hudson Light is a limited-edition beer, available in 650ml bottles at cold beer and wine stores throughout Victoria and at the brewery.